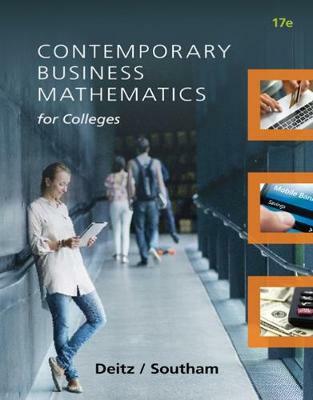 Emphasizing practical skill-building activities, CONTEMPORARY BUSINESS MATHEMATICS FOR COLLEGES, 17E presents a basic, arithmetic-based approach to business math. Through step-by-step concept development, numerous practice exercises, and real-world applications, the book equips you with the math skills you need for your career in business. Including problems and examples from actual companies, the book progresses, from the most basic to more complex business math topics. Self-check features at the end of every section and chapter enable you to monitor your own progress.